I will not post anymore O-Pee-Chee blaster or box breaks for fear of being stoned by most of the blogosphere. However, I will be posting a highlight of things I find here and there. This gem was too good not to showoff, and I also wanted to point something out on it. Clearly, this card is freakin' awesome!! Not sure why Bedard is pictured wearing a Baltimore uniform, but that is not what I wanted to point out. If you click on the picture and enlarge it, you can see that around the letters is a brownish color like it was stained or burned when putting the card together. It's like the old treasure maps we all made as kids, that brownish type color on the edges. The fact that I got 2 stripe swatches on the card made it that much sweeter. Currently at 501/600 of the set complete, which makes me happy. Anyone by chance pull the Cano triple? one of the jersey cards I got had that as well, and it carried over onto the card itself. But it wiped right off with a little moisture. Cool looking triple. What are the odds on pulling one of these? You pulling those from blasters? I just busted one tonight, got a bunch of insert cards but no relics. Pulled a Jeter face of the franchise in one though. Upper Deck is the WORST when it comes to picturing players in unis they haven't worn in 2 years. That's like the 3rd or 4th Bedard O's card from them this year. Bedard pictured with the Orioles is a good thing, IMHO. So often with UD lately, the player is pictured with their current team, but the swatch is from an old team jersey. 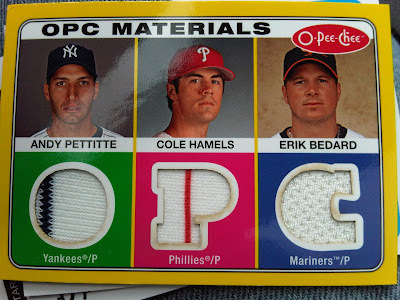 I know some people have complained and UD must have listened in this case by picturing Bedard with the Orioles since they probably used an old Bedard Orioles jersey from their inventory. I have ripped one box so far, got one triple jersey (victor martinez, russell martin, and one other catcher who I can't remember right now). no stripes. I have 3 other boxes to rip so I don't know if I got lucky in box 1 or if I might be able to expect about a triple swatch per box.